The Drum Cafe’s Shebeen Experience provides an authentic slice of township life and culture. At the location of your choice, the Drum Cafe’s sassy shebeen queen Mam’Spinza and her charismatic team of actors, actresses and dancers put on a slick show, with or without an interactive element. 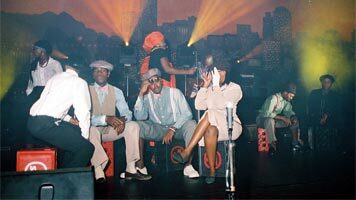 Clad in township gear and colourful 50’s-style attire, the performers alternate between Kwaito rap, Tin can dance, Township Jive, Pantsula dance performances and informal scenes. Beautiful 50’s Jazz and township songs are accompanied by guitar and drumming, with the audience encouraged to sing along. The “Shebeen Experience” can be custom-made to suit your event, with the rap sequence including details of the group’s identity or activities – especially effective when managers rehearse and participate with our team. We can include the company song in the performance, or can create one resonating with company spirit. The “Shebeen Experience” is one hour long, but if you’d prefer, the separate acts can be featured at intervals. Remember to read about the Drum Cafe’s stunning selection of shows: “African Rhythms”, “Africa Now!”, “Jozi” and Drumstruck.